There are currently 114,778 users on this website. 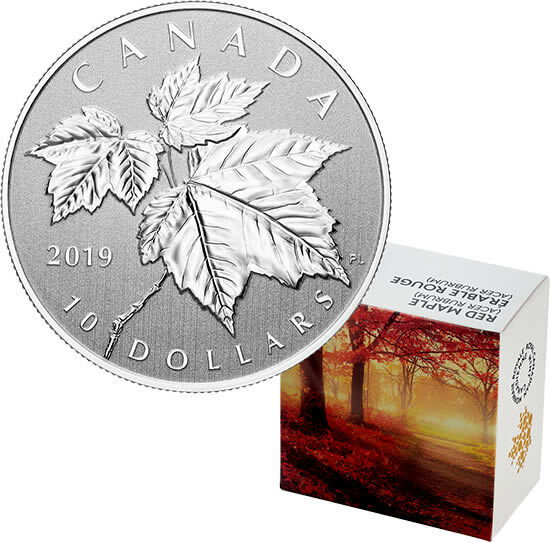 Royal Canadian Mint - Designed by Pierre Leduc, your coin showcases the peak summer foliage of the red maple (Acer rubrum) tree. Three leaves are shown in an opposite arrangement that fills much of the field. The natural positioning allows for a limited view of the long petioles that secure the two furthest leaves to the twig. Fine engraving stands in for the veins that run through each leaf's palmate lobes, which are separated by "V"-shaped notches. The obverse features the effigy of Her Majesty Queen Elizabeth by Susanna Blunt.